I’ve always enjoyed Louis L’Amour’s Western novels. The one I just finished reading—The Iron Marshal (1979)—is typically good. It’s a bit atypical, though, in that the main character is not a born and bred Westerner, as most of L’Amour’s protagonists usually are. Tom Shanaghy was born in Ireland and emigrated to the States when he was 11. He did most of his growing up in the tougher sections of New York City, where he worked for a Tammany Hall politician. Though never quite a crook himself, he lived on the edge of corruption. He also had plenty of reason to develop skill in using his fists and a gun. When gang violence breaks out, Tom is abruptly forced to hop a freight train out of town. He ends up in Kansas. Soon, via a set of rather unusual circumstances, he ends up as the town marshal. Now all he has to do is stop an angry cattleman from burning the town to the ground, foil the robbery of a gold shipment, and solve a murder or two. And, oh yes, face off against the five members of a local family who have gotten really ticked off at him. It’s a really well-constructed story, fusing the Western with elements more usually found in detective stories. (Actually, a lot of writers have done that. But it's perpetually cool whenever it's done well.) Tom’s journey from big city thug to Western lawman nicely parallels his growth as a person, as he gradually comes to realize he wants to do something productive with his life. And, as is typical in L’Amour’s novels, the action set pieces are a lot of fun, involving several fist fights as well as gunplay. 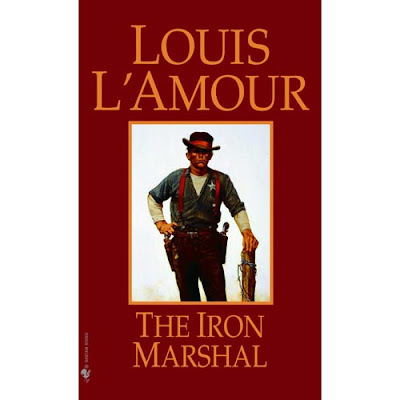 All in all, The Iron Marshall shows L’Amour’s typical strengths as a writer, but is also just different enough in terms of plot and character to make it stand out from his other works. It’s not his absolute best novel (that’d probably be Hondo), but it still makes for an entertaining sojourn back to the Old West. A bug, mutated into a super intelligent being by radiation, uses some of Hank Pym’s gas to make himself human-sized. Then, using telepathy to control all the nearby insects (except the ants, who remain loyal to Hank), he attempts to conquer mankind. 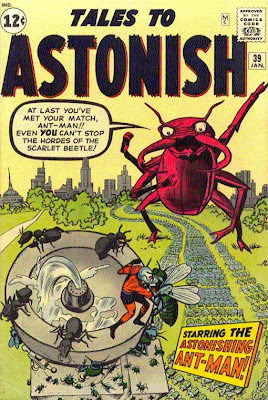 Ant Man and his ants do battle with the insect hordes. Then the tiny hero has it out with the big bug in a running battle through a toy store. Finally, the bug is captured, shrunk back down, then cured of his mutation to become just a normal bug again. 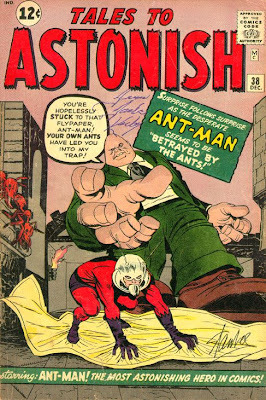 Gee whiz, Ant Man really, really needs a better quality of villain. But Kirby’s visuals are fun as usual and the concept of a smart mutant bug is interesting enough to carry the story along. Loki learns about Thor’s double identity and then escapes from Asgard. 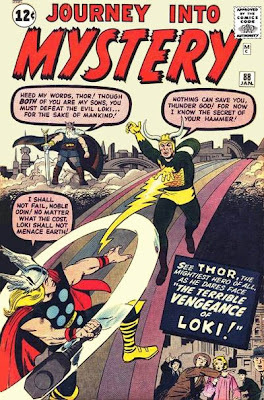 He then uses trickery to separate Thor from his hammer, causing the Thunder God to revert to Donald Blake. Then Loki goes on a mischievous rampage though New York, doing stuff like turning all the vehicles into ice cream. Fortunately, Blake out-tricks him. Getting his hammer back and turning back into Thor, he then captures Loki after outsmarting him yet again. It’s a good issue on several levels. First, it builds a little more on the Marvel version of Norse mythology, gradually building up the rich background that will allow future Thor stories to drip with imagination and powerful storytelling. Second, it’s nice to see Thor using his brains as well as his brawn throughout the issue. There’s no denying it. 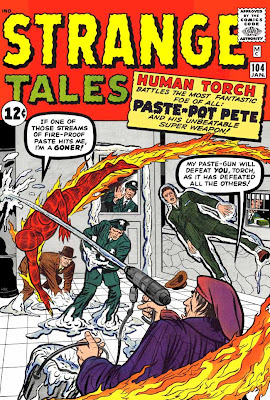 “Paste Pot Pete” is a silly name for a villain. And his costume (a stereotypical artist’s beret and coveralls) doesn’t help much. It’s certainly an accurate name, though. Pete uses his specially designed gun (connected via a hose to a pot-full of “ammunition” that he hauls around with him) to shoot streams of thick paste. He uses the sticky stuff to do things like prevent a cop from drawing his gun by glopping together the cop’s hand and holster. Eventually, Pete will adapt the less silly name of “Trapster,” get a better costume, use slightly more sophisticated weaponry and become a regular member of the Frightful Four. For the moment, though, he’s robbing banks and stealing experimental army missiles in and around Glenville. Sadly, Pete’s gimmick isn’t really strong enough to carry even this short story. The Human Torch actually has quite a bit of trouble stopping him when there’s really no logical reason he couldn’t have caught the villain in just a page or two. But it takes him the whole thirteen pages to chase Pete out of Glenville and recover all the stolen loot. One of Jack Kirby’s many strengths as an artist is his ability to choreograph fun action scenes, but he’s just not up to his usual heights this time around. The fact that Paste Pot Pete just isn’t powerful enough to believably give Johnny a real challenge is probably to blame. That’s it for January 1963. February will see the first appearance of the aptly named Impossible Man (as well as the ear-wiggling mailman Willie Lumpkin); Ant Man will go up against a truck hijacker; Thor will have more trouble than he should against a common gangster; and the Human Torch will have a rematch against the Wizard. It may be murder, but that doesn't mean there isn't time for a song. The main reason I enjoy the B-movies of the 1930s, 40s and 50s as much as they do is that they were so good at basic storytelling. In the best of them, the plots moves along quickly and logically. There’s no pretension to them at all—story was everything. Well, almost everything. The best B-movie series had likeably protagonists (Charlie Chan, Hopalong Cassidy, Andy Hardy, etc.) and they also had a real sense of fun. In mysteries and westerns, this is often emphasized by the inclusion of one or two comic relief characters. But there’s other ways to make sure these short and fast-moving films stay fun from start to finish. Sometimes, they’d manage to throw in a song or two. Of course, for some B-movies series, this was a natural part of their world. Roy Rogers and the other singing cowboys, for instance, would always pepper their music throughout their films. But every once in awhile, we’d get a pause in the middle of a murder investigation to hear a tune. 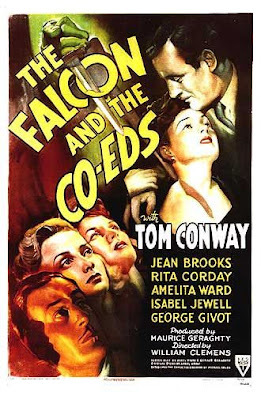 I just watched The Falcon and the Co-eds (1943), with Tom Conway playing the suave detective and ladies man. Conway is typically good in the role and the mystery (involving a couple of murders at a conservative girls’ college) is well-constructed. And, of course, the setting gives an excuse to show an even higher number of pretty girls than is usual in a Falcon film. We normally get three or four. This time we get dozens. But we also get some music. The girls are putting on a talent show. Even with dead bodies turning up, the show must go on. And so the movie pauses a couple of times to toss in a song or two. And they’re pretty good songs as well. I suppose one reason for this was that the main plot didn’t quite fill up the usual B-movie running time of about 64 minutes, so they needed the filler. But even so, the inclusion of the songs is fit into the story and only adds to the sense of good fun that fairly drips from the movie. It reminds me of yet another case in which a B-movie murder investigation made way for a song. In Nancy Drew, Reporter (1939), Nancy and her boy friend Ted trail some suspects to a Chinese restaurant. The two obnoxious kids they are forced to bring along order too much food and they haven’t enough money to pay for the meal. This leads to Nancy and her companions literally singing for their supper. The restaurant has a band. (Chinese musicians in traditional garb, but playing jazz on modern instruments. Go figure.) This band supplies the music as the desperate and unwilling performers improvise songs out of nursery rhymes. They are, of course, a big hit. And the entire scene—silly as it was---is overflowing with pure fun. Back to The Falcon and the Co-eds—mention should also be made of how charming and delightful were the Three Ughs. The daughters of the school’s grounds-keeper, the three kids dress alike, speak in consecutive sentences (one after the other, finishing up each other’s thoughts) and do a bang-up job with one of the songs. Of course, at one point they insist on helping the Falcon with his investigation. It’s nice to hang out with them for awhile and they’re yet another example of the sense of fun the best of the B-movies exuded. They don’t make ‘em like this anymore. I swear to heaven, I have no idea why. When last we saw Dr. Doom, he was clutching a small asteroid which was hurling its way into deep space. But now we learn that he was rescued by an alien space ship and has now made his way back to Earth. This sets up a really, really cool issue. Doom actually makes use of Stan Lee and Jack Kirby (who, even within the Marvel Universe, publish the FF comic book) to lure Reed Richards into a trap. Then he switches bodies with Reed. Reed—now in Doom’s body—desperately tries to convince his teammates of his real identity, while Doom---now in Reed’s body---subtly lures the others into a trap. It’s a strongly written issue with some more great bits of characterizations for just about everyone (even Alicia Masters) and it all leads up a tense conclusion. In the end, of course, the two arch enemies are switched back into their own bodies and Doom is reduced to apparent nothingness by a reducing ray that he had planned to use on Sue, Ben and Johnnie. A well-written and entertaining issue. 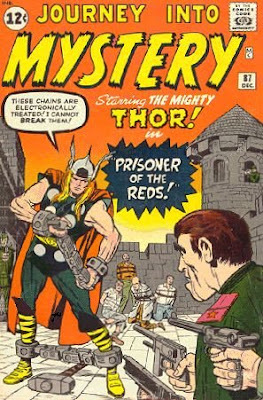 By now, it’s apparent that Lee and Kirby have a firm lock on the characters and themes needed to make the book work dramatically. This one contains two separate short stories. 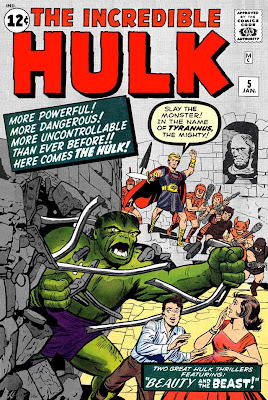 In the first, the Hulk and Rick Jones rescue Betty Ross from the clutches of an immortal tyrant who lives in an underground kingdom. In the next, the big guy and Rick travel to Asia to stop the conquering army of an evil warlord. Both are okay stories, but they are still thematically awkward. By now, we’ve reached a point where Bruce Banner uses a ray machine he built to turn into the Hulk whenever he needs to do so. There’s an attempt to introduce some pathos into the character by telling us there’s always a chance he won’t be able to change back into Bruce afterwards, but giving him that much control over his transformations just isn’t what the Hulk is supposed to be about. Lee and Kirby might have a lock on what works for the Fantastic Four, but the Hulk isn’t quite where he needs to be yet. 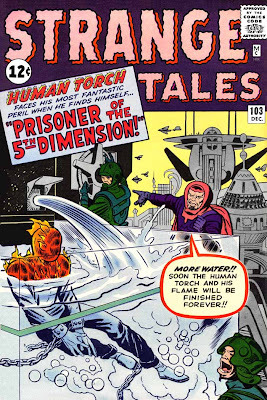 Next time, we’ll finish off January 1963 with a look at what Thor, Ant Man and the Human Torch are up to. But the extras that come with each set are pretty awesome as well. The commentaries included on some of the cartoons are always worthwhile and the documentaries on various aspects of the animation process and the characters are, without fail, both entertaining and informative. The documentary also does an excellent job of stressing that Mel was not just a guy with a wide vocal range, but a great actor as well. As one of the people interviewed in the documentary suggests, watch any Looney Tunes cartoon in which Mel did any of the voices. Take note of how perfectly he hits every emotional note needed for every single line of dialogue. It’s really astounding work—done (from our point of view) with such seeming effortlessness that we need to think about it to realize just how brilliant it is. There are also some very nice reminders that Mel was very active on radio, working with Jack Benny and other stars of that medium to produce some classic bits of comedy. The coolest part of the documentary is learning just how kindhearted and utterly decent a person Mel Blanc was. It turns out that he was a great husband and father. He loved kids and often visited children in hospitals (without publicity) to entertain them. He liked to make people smile and laugh. He was a just plain nice guy who really seemed to regularly think about the feelings and welfare of others. Often, entertainers we admire for their work in films or other mediums turn out to be real jerks in real life. For the most part, this is really none of our business and it’s easy to discount it and just enjoy the work they produced for what it is. But it’s really nice to be reminded that—every once in a while—an artist we admire for their work is also someone we can admire even more as a human being. 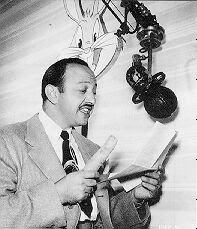 The world is an infinitely better place because Mel Blanc was in it. Donald Blake, along with a number of other American scientists, is kidnapped by Communists and taken to a castle fortress behind the Iron Curtain. Once there, he turns into Thor and busts the place up. He and the scientists then contact the local Resistance and get smuggled back to America. That’s pretty much it. It’s a step backwards from the more cosmic level threats that Thor had been dealing with for the last couple of issues (Loki and a time traveler) and it’s actually a bit dull. This story, I’m afraid, is a definite misstep in the development of the character. But things will soon be looking up again---he’ll be going another round against Loki next issue. Despite having STARRED IN A BOX-OFFICE HIT MOVIE IN AN ISSUE OF THE FANTASTIC FOUR THIS SAME MONTH, Johnny Storm is still working to preserve his “secret identity” as he arrives at his high school in Glenville. There’s just no denying it—everyone in Glenville is an idiot. Johnny stumbles upon some inter-dimensional aliens planning to invade Earth. 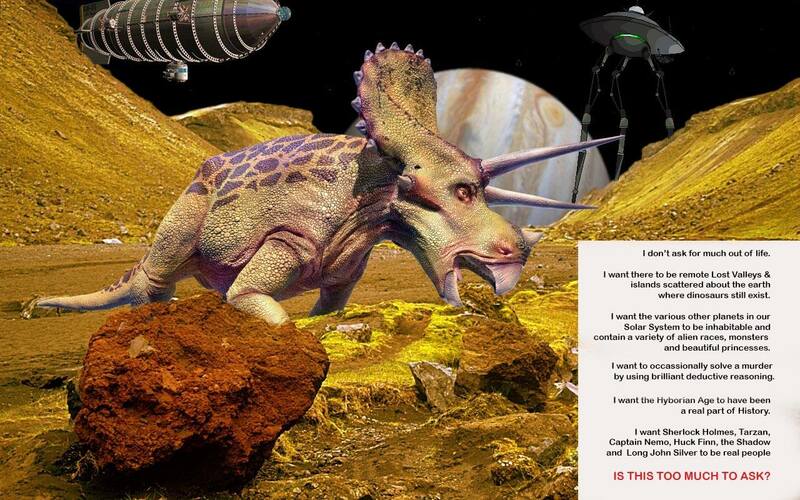 Captured and taken to their dimension, he’s rescued by members of an anti-war faction. He leads them in an attack against the invading army and inspires the average people to revolt against their despotic ruler. It’s actually not a bad story—any comic that allows Jack Kirby to design some cool-looking sci-fi gadgetry is always worth looking at. But the complete lack of continuity with the Fantastic Four book continues to be annoying. I suppose it’s really the fault of the citizens of Glenville—did I mention that they are all apparently idiots? Or perhaps news broadcasts and major motion pictures starring JOHNNY STORM AS THE HUMAN TORCH just don’t play in Glenville. That’s it for December 1962. Next time, we’ll enter 1963 to see Johnny meet up with yet another future member of the Frightful Four. 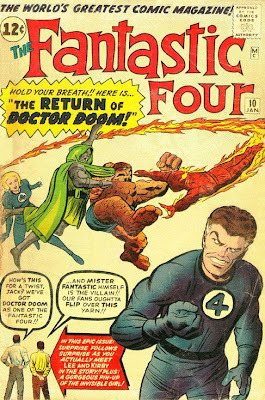 The Fantastic Four will face off against Dr. Doom for the third time. Thor will fight Loki for the second time. The Hulk will smash more stuff and Ant Man will go up against a really smart bug. It’s a pretty creepy way of murdering someone—drugging your victim with a chemical that forces him to laugh himself to death. Or, at the very least, have his face contort into a grotesque smile when he dies. The most famous killer to employ this uncanny method of murder was, of course, the Joker. 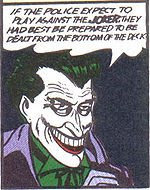 First appearing in Batman #1 (cover dated Spring 1940), the Joker is one of the great comic book villains. It’s a great story, with a strong script by Bill Finger well-served by Bob Kane’s effective, atmospheric art. The Joker introduces himself to the world by publicly announcing his intent to rob and murder particular people at particular times. No matter how well-guarded these people are, the Joker manages to keep whacking them at the exact pre-planned times. He uses a toxin of his own design that leaves the dead men with wide, bizarre smiles on their faces. Batman and Robin put a stop to the Joker’s schemes, but it won’t be long before this visually creepy villain returns to wreck more havoc. The March 10, 1940 episode of The Shadow radio show (with Bill Johnstone starring as the invisible crimefighter) involved a man who was injected his victims with a drug that caused them to laugh as they die. The script, by Sidney Sloan, is a good one, helped along by the very, very effective sound effect of the maniacal laughter of the dying victims. It’s a really spine-chilling episode—demonstrating how dramatic radio could often build an entire story around one particular sound. The Shadow episode aired about two months before Batman #1 was published. The time-frame is too narrow to assume that Kane and Finger were pilfering an idea--the two similar methods for murder were simply coincidental. But it does seem as if the Shadow's nemesis narrowly beat out the Joker to be the first to use this particular M.O. Or did he? Actually, the mastermind behind a really weird real estate scam was the first, as detailed in the July 1938 issue of Doc Savage. The story in this issue was titled “The Giggling Ghosts,” written by Lester Dent. A residential area in New Jersey seems to be infested with, well, ghosts that giggle. Before long, some of the local citizens begin giggling uncontrollably as well. Several of them die. Doc Savage and his assistants investigate. As is typical in their adventures, there are more double crosses, triple crosses, false leads and faked deaths than you can shake a stick at. 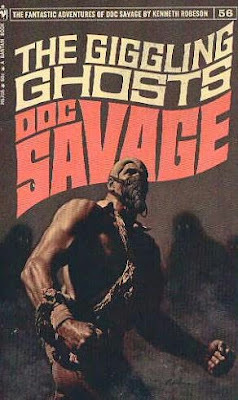 The heroes get captured by the bad guys, then escape only to get captured again, before Doc Savage manages to pick the real mastermind out of a host of suspects and put an end to the villainous scheme. So there you have it. One prose story, one comic story and one radio play, all featuring murders accompanied by smiles, giggles or laughter. All were published in less than a year’s time. Even taking the Doc story into account, the time frame is still too narrow to assume that any one writer was lifting the idea from one of the others. It seems to be a weird coincidence, in which the world of fictional characters inexplicably suffered a brief but violent plague of killers using the same eerie method of dealing sudden death. But whatever the reason, the world is a better place because of it. All three stories are excellent examples of the strong, entertaining storytelling that was a regular part of our popular culture in those bygone days. 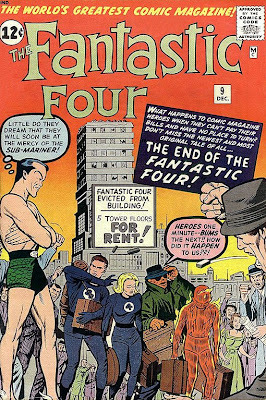 Well, it seems that economic hard times are hitting everyone—even the Fantastic Four. Reed Richards has unwisely invested the money he makes on patents and inventions in the stock market and now they’re all broke, forced to sell their skyscraper headquarters and all their equipment. Fortunately, they soon get an offer to come to Hollywood and make a movie for (cue Dr. Evil voice) ONE MILLION DOLLARS. In a hilarious panel, the four hitchhike out to Hollywood. Of course, the movie thing turns out to be a plot of the Submariner, who leads the three male FF members into different traps so he can get a chance to propose to Sue. But the FF manages to get the best of him. Defeated, Namor honors his agreement to finance the movie (using a fortune in sunken treasure to do so). The film is, of course, a huge hit and the Fantastic Four regains their financial footing. Some of the story elements are undeniably dated and silly, but it’s still a good issue. Stan Lee’s efforts to inject real-world problems into the lives of his heroes makes for some effective bits of character development, as the group decides to stick together despite their troubles. And it’s fun to see Reed—so smart at the science stuff—screw up financially. In terms of the action stuff, a sequence in which Reed has to fight a giant Cyclops is yet another classic Kirby fight scene—full of imaginative and entertaining visuals. We also see Ben’s relationship with Alicia continuing to humanize him. Sue gets a little annoying when she reminds us that she’s still torn between Reed and Namor. (“He—He’s so masterful. So confident!”), but she’ll get over that eventually, so we’ll forgive her. But the ants prove to be loyal-- Ant Man avoids a trap and helps capture a squad of mob hitmen. Egghead gets away, but ends up living in a flophouse muttering about how ants had outsmarted him. It’s another average issue—good but not exceptional. Egghead, though, will return before long. He’ll pretty much be the closest thing to an archenemy Hank Pym will have. This highlights a problem with the series that I’ve mentioned before. To a large extent, a hero is only as good as his villains. While the FF gets to fight Dr. Doom, Namor and other cool villains, Ant Man is pitted against a pudgy mad scientist with a dumb plan and hordes of Red Shirt mobsters and spies. Still, he’s only five issues away from getting a cute partner and less than a year away from joining the Avengers, so things will look up for Mr. Pym eventually. Next time, we’ll finish December 1962 with a look at what Thor and the Human Torch are doing with their free time. I'm not going to go in any particular order--just reading whichever one of the list strikes my fancy. But I will get through the entire list before stopping. And I'll always let you know (in case anyone wants to read along) which one I'll cover in the next month's post. So--for the first Thursday in February--we'll be looking at "The Hound of the Baskervilles" starring the Great Detective himself--Sherlock Holmes.